Chukwuma Soludo, former governor of Central Bank of Nigeria (CBN), and Patrick Utomi, a professor of economics, have called for the immediate release of Nnamdi Kanu, leader of the Indigenous People of Biafra (IPOB). Kanu has been in detention since October, 2015. The thought leaders under the aegis of ‘Nzuko Umunna’, a pan-Igbo group, also called for the release of his colleagues who are in jail. They declared that Nigeria was more divided now than before. Delivering the statement of the group in Abuja on Tuesday, Soludo condemned the killing of IPOB members in the south-east. Amnesty International had put the number of pro-Biafra protesters killed by security agents at 150, an allegation that the military denied. He also called for an investigation of the killings. “We are a delegation of Nzuko Umunna, a pan-Igbo group,‎” he said. ‎”We visited Nnamdi Kanu to hear his own point of view as well as share our own point of view with him. “We believe that Nigeria has the potential to be great, and like most countries has its own challenges. “Nigeria has never been more divided than now. Most discerning patriots have come to the conclusion that Nigeria as currently structured is destined to be a failed state‎. “It is our considered view that most of the agitation is in response to a looting elite. We do not condone violence. “We note that in 2015 Nigerians voted for change. As the ruling party, the APC has it a duty to deliver to the Nigerian people. “So far, APC seems to have abandoned its cardinal duty to Nigeria. We are in a state of emergency at all levels. 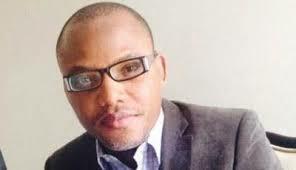 ‎”We demand the urgent release of Nnamdi Kanu, and his colleagues as part of the process of engineering a new Nigeria. Soludo also cited cases in which the government failed to release Kanu despite court orders as an example of how he had been put below the law. Utomi‎, who responded to questions on behalf of the group, spoke against the secret trial of Kanu, saying “it has no basis at all”. A federal high court in Abuja had ordered the secret trial of Kanu. On his part, Utomi said the group would approach the International Criminal Court (ICC) on the matter if it became necessary. ‎”We will do everything that is necessary, we will internationalise the issue. When you incarcerate Nnamdi Kanu, it is not he that is incarcerated but the people of conscience,” he said.